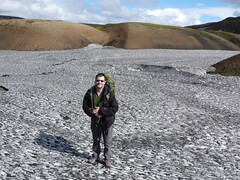 In 2002 I was stranded on Iceland with little but the clothes on my back. In this spectacularly expensive country I was very nearly broke and all my bags were so anxious to get home from a year abroad that they skipped my extended layover and went directly to NY. But, in the way things often do when traveling on a shoestring, it worked out. This time it took the form of an Australian guardian angel who'd made entirely too much money working off the coast of Norway for a year and wanted a friend to explore with. It was only a couple days and I got just enough of a taste of this fascinating country to swear I'd be back. Erin, as it turns out, has lifelong attraction for gnomes and surreal landscapes so we pleaded with the airline until we got our one hour layover in Reykjavik extended by a week. The only problem was, Iceland is so spectacularly expensive that it really is out of reach to a couple who just quit their nice jobs to work in Sub-Saharan Africa. This time the guardian angel took the form of some despicable American money managers who'd thoughtfully imploded the world economy a couple years before. Iceland has a tiny population and too many people worked in international financial services. With few resources other than surreal natural beauty, wool and hot water the economy of Iceland crumbled and the Kroner halved in value relative to the dollar. What was once impossibly expensive, became merely extremely expensive and we booked the flights. The legendary Blue Lagoon is a small lake of opaque water that bubbles up from ground so hot that they built a power plant on top of it. Instead of burning mountains of coal to power their cities, Iceland has clean and inexpensive geothermal energy. Coal plants generate massive amounts of waste which sometimes causes disasters, like the TVA slurry spill in 2008 that dumped tons of toxic chemicals into the water supply in Tennessee, crippled the local ecosystem and will cost nearly a $billion to clean up. In Iceland, their system works differently. In 1976 they built a geothermal powerplant outside of the capital city Reykjavik. Like the coal plant, it too constantly spills out a byproduct. The difference is, people started bathing the hot mineral water the geothermal plant produced. Before long, the bathers noticed that it helped with health problems and the minerals did wonders for their skin. 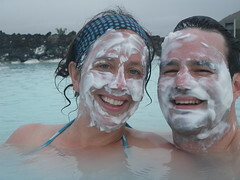 So, while in Tennessee they'll be cleaning up their disaster for generations, in Iceland they built a luxury spa next to the power plant and sell mineral creams worldwide as high end skin care products. Call me crazy, but I like their system better. Although geothermal power plants only work in volcanic regions, it would work well in parts of the US. The oldest democracy (~930AD) is located on one of the newest landscapes on earth, a country that grows about an inch every year as the the North American and European continental plates pull apart. There aren't many species of plants and animals because its an isolated island that was buried under a massive glacier during the last ice age. That seems like a long time ago, until I found that about 10% of the country is still under ice today. When I came to Iceland the first time I was intrigued by the landscape, but mostly only saw it through the bus window. One of the many benefits of being with a Colorado girl is that she craves mountains and insists on making time to be in the wilderness. 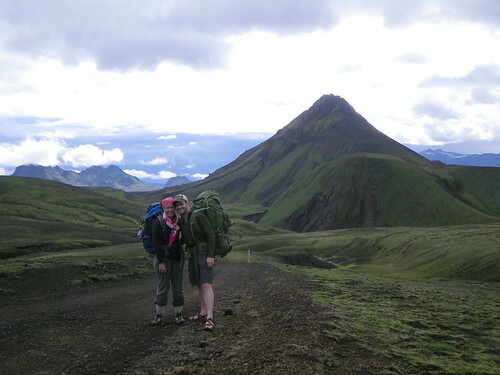 We'd heard of a legendary four-day 53km backpacking trip in the south east. Thanks to the devious machinations of gnomes we only had three days free to do it, which was disappointing until Erin noted that since the sun never sets we could hike all day (uh oh!). The landscape is quite unlike anything I'd ever seen before. Even within the hike itself the views were so unique that every couple hours it looked totally different. Rather than describe it with words, click below for a slideshow of our pictures (or click any picture to get to our Flickr site). It was a tough hike, and the weather ranged from sunny and pleasant, to intense hailstorms. Most of the time we were alone, but the route itself is divided by public campsites every 12-16 km apart. Although they offered little but flat spots for a tent and an outhouse, they were a godsend when trudging through occasionally brutal weather late into the daylit night. It was an amazing and rewarding trek. 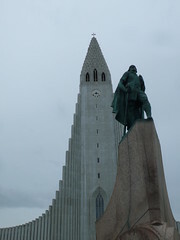 Although we were disappointed not to have seen any gnomes in Iceland, they did pilfer some of our stuff along the way. They got my camera charger, and a passport... but at least they had the decency to give the latter back. Next time we're in Iceland, I'm going to have to capture one.